It was raining when we woke up and the skies remained gloomy when it ceased spilling left-over fresh spit. The drizzle left the numerous plants and trees around Villa Sylvia resort dripping and the grass slippery and muddy. We left Abigail's unopened Tanduay rum and Fundador to one of the caretakers as token of niceties. Abigail left the previous day after concluding our lake hopping trip in San Pablo to attend a family gathering. That left me and Cathy to finish off the weekend by checking out the Underground Cemetery in Nagcarlan. The cemetery can be easily reached as it is located by the side of the highway - just take any jeepney going to the opposite direction of San Pablo. I really wanted to see this place since I'm becoming interested with old cemeteries. I've lots of memories of being in one, as an avid follower of our country's tradition of spending November 1, our day of the dead - with our departed ones, I've gotten used to reading tombstones, computing the age of the dead by merely subtracting their year of death to the year they were born. Imagining as well, the state of the world they used to live in. Not much I could imagine if I'm only visiting the newer cemeteries where they take off the bones of those been dead for 20 years. That's why I dig the older cemeteries that still houses the remains of those once mortals who died in the 1900's and until the 1940's. Those time and now are certainly two vastly different worlds. And somehow reading their tomb epitaph, gives me a dream-like image of the world they were in when they died. I saw a few ones at Nagcarlan Underground cemetery that dates back to WWII years and somehow my mind was filled with images of horrors, of war, of violent death but somehow I had hoped that it was just an illness brought on by the hardships of life during that time. I would never know for sure, just the consolation thought that they are at peace wherever kingdom their souls are to right now, gives me a calm and abrupt understanding about the cycle of life and death. Entering the cemetery, you will pass by a vaulted arched entrance made of stones and two iron grill gates. Inside you will be greeted by an almost perfectly landscaped grass filled grounds leading to a small baroque style church. It was like a switch dial was clicked and I felt transported back through time and Cathy started voicing her apprehension about going inside the underground cemetery. It would be a blast though if the world around us retorted back to to 1845 when Father Vicente Belloc, a Franciscan priest headed the construction of the underground cemetery. During the 1896 revolution the crypt was used by the revolutionary leaders in Laguna as a secret meeting place. The Presidential Decree (P.D.) No. 1505 on July 11, 1978, which amended P.D. No. 260 of August 01, 1973, the Nagcarlan underground cemetery was proclaimed a Philippine historical landmark. Historic and somewhat creepy at the same time - yet its a charming cemetery if ever there's one, along with San Joaquin Cemetery its definitely among the most awesome permanent retirement places in the Philippines. We stayed a while underground trying to read the epitaph on each tomb and just admiring the small but goth like setting with the sunlight seeping through the well placed windows and holes located along the walls, which produce enough illumination and compliment its eerie dark corners. As we climbed back the stairs into the small baroque chapel and into the open ground and the rain starts pouring again - there must have been many days like this when in the old times they were burying the dead in this cemetery and the sky just shed tears profusely. One can feel the somber mood yet at the same time distinguish the feeling of the past with the present upon hearing the horns of passing vehicles by the road. I was glad I'm back in my own time but grateful that I've at least imagined a time in the past because the Nagcarlan Underground Cemetery was able to at least transport my mind through its storied crypt. While waiting for the rain to stop, we took shelter at the nearby St. Bartholomew the Apostle Church, made of brick and stone and has been standing amid fire and other natural calamities since 1752. The rain stopped after half an hour, Cathy and I then hurriedly took another jeepney ride en route to the town of Liliw. 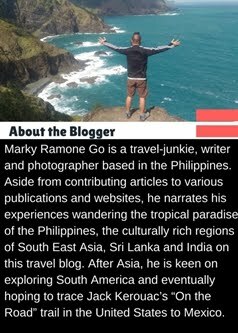 Been here marky(2008), sayang syunga pa aq magblog nun ala aq write ups jejeje, sarap mag ikot sa part ng laguna na to, heritage churches en sites plus the cold weather en relaxing nature!